How to approve and prioritize among projects that aim at biodiversity conservation has been highlighted as one of the most critical decisions that conservation planners face . This is not surprising, because conservation outcomes are often achieved through complex mechanisms, and the success of conservation actions is rarely guaranteed, with many uncertainties preventing precise impact prediction. Success is even harder to predict, when conservation agencies aim to strengthen biodiversity indirectly, e.g., by supporting livelihoods and economies of local people as an incentive for them to conserve biodiversity outcomes . Investing in biodiversity based value chains does not necessarily result in positive biodiversity outcomes. Negative impacts can arise, when value chain development results in depletion of the biodiversity that forms the resource base, on which the value chain depends (e.g. fisheries or non-timber forest products). The production of honey is an example of a biodiversity based value chain that strengthens rather than erodes the conservation of biodiversity . This is because honey producers have an interest to conserve the vegetation and plant species that produce the nectar and pollen that supports the value chain. The development of honey value chains typically revolves around a combination of introducing improved bee keeping and honey production techniques and improved access to markets for honey . Yet, while attractive at first sight, such improved techniques are not always easily adopted . An important reason for this is uncertainty among farmers about the financial outcomes of their investment in improved honey production techniques. A detailed cost-benefit analysis on beekeeping projects can be considered to reduce the perceived uncertainty. However, there are rarely sufficient data on all relevant aspects of an investment decision to allow precise, purely data-driven projections to support decision-making . Given such a lack of perfect knowledge, decision-makers need appropriate tools for handling uncertainties, and for identifying and prioritizing knowledge gaps, whose narrowing would reduce their chance of selecting a suboptimal decision option [7, 8]. Furthermore, decision-makers need improved capabilities to quantify risks surrounding proposed interventions, because failure to adequately account for risk can lead to high chances of project failure . The Stochastic Impact Evaluation (SIE) approach allows for a structured decision analysis that incorporates all relevant variables, even those with uncertain and missing information . It considers risk factors that may compromise project success or affect project performance. The approach incorporates Value of Information analysis that prioritizes critical uncertainties in a project, where further research has the greatest potential of enhancing clarity on the decisions. 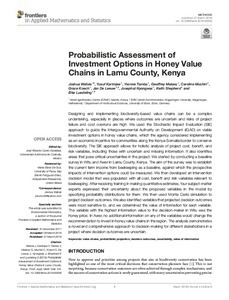 The present study uses the SIE approach to assess investment decisions in honey value chains for the Intergovernmental Authority on Development (IGAD) in its program on Biodiversity Management (BMP).